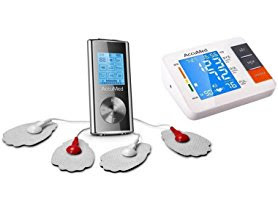 Today only these AccuMed TENS Massager or Blood Pressure Monitors start at $24.99 (Retail $44.99+)! Versatile: Eight auto-routines have been carefully designed based on the muscle stimulation patterns of various therapeutic and massage techniques such as "Tuina," "Acupuncture," "Tapping," "Guasha," "Cupping," "Weight Loss," "Body Building," and "Combination" modes. Add to that twenty selectable intensity levels and you have total control in achieving treatment that is perfect for your individual needs. Easy to Use: Plug the electrode lines into the unit at one end and the pads at the other end, place the pads on the treatment area (such as your shoulder), and power on the unit to select a routine (such as "Acupuncture"). The large LCD display shows the chosen settings and remaining time, which can be specified from 10 to 60 minutes. The AP210 is designed to operate as simply as a music player. Natural: Transcutaneous Electrical Nerve Stimulation (TENS) technology has been used by doctors for more than 30 years. Gentle and continuous electrical stimulation triggers the body's natural endorphin response to block and relieve pain as well as stimulate the regeneration of tissues, all without the use of any drugs or chemicals. Intelligent: Inflates automatically after one button press for quick and accurate measurements of BP and heart rate, with on-screen indicators for arrhythmia and hypertension (per WHO grading standards - mild, moderate, or severe). Easy to Use: Large backlit display, plus option for voiced audio instructions and readouts. Battery Saving: Auto-off feature and smart power engineering enable you to perform over 200 measurements with four AA batteries (included). AC Adapter is also included for operation with wall outlet power. Built-in Memory: Stores the last 90 readings automatically to help you easily monitor your health over time.